Last September I published an article in The Daily Transcript, “Defrauding of the United States Congress by Elements within the United States Military: The Murder of Marine Colonel James E. Sabow." No comments were received despite this report of extraordinary unethical behavior by a number of individuals in the investigation of the Colonel’s death. The failure of the Department of Justice (DOJ) and the Department of Defense (DOD) to investigate the Colonel’s death in good faith documents high level corruption in these agencies. I am a scientist with more than eighty publications in eight fields of science, seventeen of these publications were written as a result of my eleven-year tenure at the Scripps Institution of Oceanography (www.meixatech.com/cv.pdf). My scientific training at Scripps included a foundation in scientific ethics. I have worked on hundreds of criminal cases, mostly homicides; my experience and training qualify me for crime scene analysis. My and Dr. David Sabow’s analysis of the evidence from the crime scene and autopsy leave no doubt the Colonel was murdered. If you, the reader, doubt us and think, “just another irrational conspiracy theory,” I suggest you examine the evidence (www.meixatech.com/SABOW&BURNETT.pdf). Figure 1.The simulated suicide scenario for the Colonel promoted by the DOD which is unlikely because the found body position (Fig. 2) could not have resulted from this manner of death. The evidence we present has never been addressed by either the DOD or DOJ despite overwhelmingly showing the Colonel was the victim of a homicide. Why? Because this evidence of homicide is so credible that it cannot be countered. The DOD chooses to counter our work by ad hominem attacks on Dr. David Sabow and apparently myself instead of addressing the evidence in this case. It is the ultimate hypocrisy to see an agency like the FBI protecting individuals within the Federal Government who are complicit with murder, indeed probably the murderers themselves. Our National Security depends on ethical behavior of our leaders. The murder of Colonel Sabow and the events following show morality is not a quality of our Federal Government and hasn’t been for quite some time. 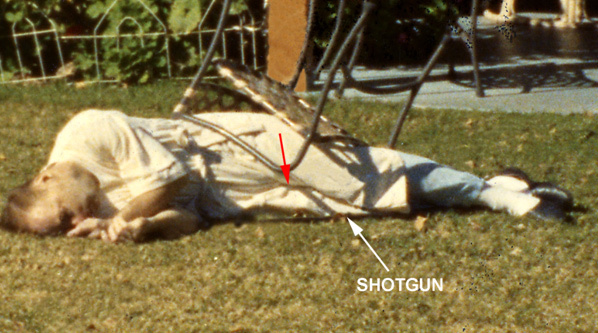 Figure 2.Death scene photograph showing the Colonel’s bathrobe tucked between his legs at the crotch (red arrow). only support homicide. No blood deposits or anything else connected to the Colonel’s death was noted on the exterior of the shotgun. In the suicide scenario, extensive bloodying of the shotgun should have occurred. This, in addition to the lack of fingerprints on the exterior surface, indicate the shotgun was cleaned prior to being placed under the Colonel’s legs (Fig. 2). Any competent, experienced crime scene reconstruction expert would conclude homicide upon examining the crime scene reports and photographs as well as the autopsy report and photographs. Indeed, there is no evidence to indicate suicide, the official position of the DOD and DOJ. Figure 3.Death scene photographs of the showing the bathrobe tucked between the Colonel’s posterior legs to his buttocks. A. Photograph of the Colonel from the rear. The red dashed lined approximates the lower hem of the bathrobe under the chair seat. B. Enlargement of A (enhanced in Photoshop). The bathrobe folds into the buttocks. C. An anterior view of the Colonel showing the configuration of the bathrobe under the patio chair D. Enlarge from C; the bathrobe can be seen clinging to the buttock (enhanced in Photoshop). This documents the folding of the bathrobe into the buttocks and not a snagging by the chair of the bathrobe. E. Another view of the body under the patio chair showing the bathrobe was tucked into the buttocks. F. A simulation using a mannequin that approximates the rear folding of the bathrobe into the buttock of the victim. No photographs of the body with the chair removed are available. of the homicide by claiming the Colonel’s death was not under the jurisdiction of the Federal Government despite the death occurring on a US military base under exclusive federal jurisdiction and the victim, a serving Marine Corps Colonel (www.meixatech.com/DoJtoHunter2007B.pdf ). The staging of a death scene can usually be discovered by an experienced investigator. The goal of a person or persons staging a death scene is to cover up the true manner of the death of the victim. 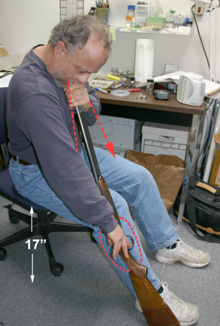 According to the DOD’s expert, Jon Nordby (www.meixatech.com/SABOWREPORT-NORDBY.pdf ), the Colonel was sitting in a chair, inserted the shotgun in his mouth placed his left hand around the barrel at his mouth and with right hand depressed the trigger (Fig. 1). The force of the intraoral blast without an exit wound caused the Colonel to be thrown back onto the lawn with the chair ending up on top of him. It is unusual he would tuck the bathrobe between his legs to his crotch (Fig. 2) prior to the shotgun discharge, but this feature did not initially cause suspicion of body staging. A photograph of the posterior of the body (Fig. 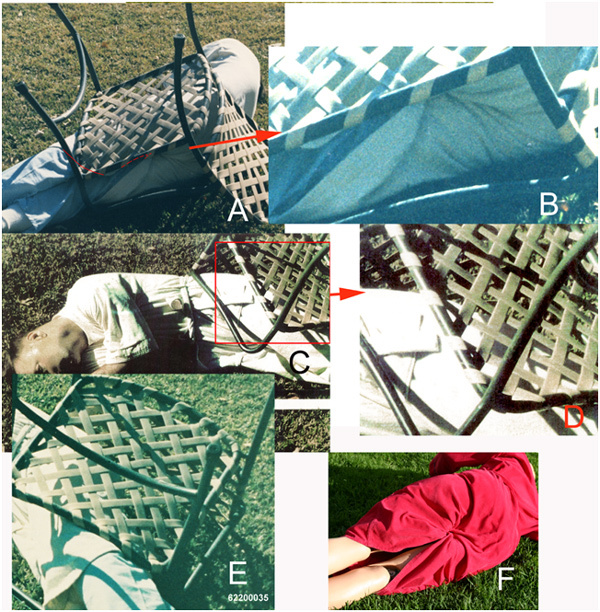 3A), the bathrobe has the initial impression of having been snagged by the patio chair when the victim fell backward as hypothesized occurred in the suicide scenario. However, enlargement of this photograph and enhancement indicate the bathrobe is also tucked into the buttocks (Fig. 3B). Other photographs confirm (Figs. 3C - 3E). In order to have the configuration of the bathrobe folds as shown on the victim (Fig. 3B), a simulation of the bathrobe on a mannequin (Fig. 3F) supports it having been tucked between the posterior proximal legs and the buttocks. It is unfortunate and a violation of crime scene processing protocol that pictures of the Colonel were not taken when the patio chair was removed. If photographs of the body had been taken without the patio chair, the staging of the body would have been quite obvious. It is impossible for the Colonel to have tucked in his bathrobe both front and back prior to his alleged patio-chair suicide. These features must have been performed by somebody else. The Colonel’s body was staged. As of this publication, the United States DOJ and DOD have elected to ignore the evidence of the assassination of Colonel James Sabow. I challenge these agencies to show I am wrong by legitimate peer review. Obviously, they will not because if they did they would have to admit there was and still are criminals prospering in our Federal Government. I have provided links through www.meixatech.com/SABOW&BURNETT.pdf and (http://www.sddt.com/news/article.cfm?Sourcecode=20140904cwz) to the evidence and reports in this case. I invite critical scrutiny of the documents, especially those from myself, Dr. David Sabow and the DOD investigator, Jon Nordby. Please send comments to brburnett@meixatech.com. Comments will be published daily: www.meixatech.com/ColSabowComments.pdf . Photographs from the crime scene used in this report by permission of the Sabow family. * Bryan Burnett lives in Cardiff-by-the-Sea, California. He is a gunshot residue and digital imaging expert as well as a certified crime scene reconstructionist and has over eighty publications spanning more than forty years in eight different fields of science (www.meixatech.com/cv.pdf).